Can we harvest the power from eels as a source of electricity? Khalil - All organisms give off a weak electric field. But electric eels are one of a small number of fish species that can generate strong pulses of electricity with their body and they use them to great effect. But how do they do this? I spoke to Dr. David LaVan from the National Institute of Standards and Technology. 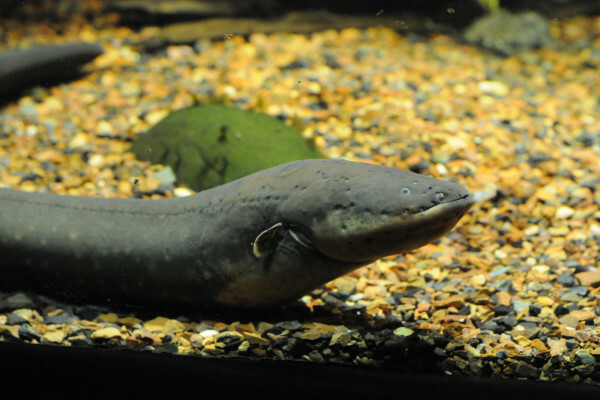 David - Electric eels produce electricity in brief spikes, in much the same way that humans do. When a human decides to move a muscle, an electric impulse called an action potential, fires in your brain, travels through neurons causing a muscle to contract. These individual signals carry very little power. Khalil - The eels use a weak electric pulse to scan for the natural electric fields of smaller fish in the murky Amazonian waters, where they live. Once they find something tasty, they send out a stronger pulse that can paralyse or even kill their victim, making for an easy meal. David - The cells that produce electricity in the eel, called electrocyte,s also create action potentials. But the electrocytes are stacked together to increase the total voltage in current. Large eels can produce up to 600 volts. Khalil - Ouch! 600 volts is nearly three times the voltage of mains electricity in the UK and 5 times what you get in America. So can we harness this stunning power? David - It is technically feasible to power human devices from eels or electrocyte cells but practically speaking, the electricity from eels is not very useful for us. First, it's important to recognise that eels convert energy from the food they eat to electricity. There's no free energy. Secondly, electric eels are just not very efficient in producing electricity. It turns out, they can convert about 15% of the energy in their food to electricity under ideal conditions in their natural environment. However, that value doesn't consider the energy needed to maintain them in an artificial habitat. Energy needed to heat and purify their water as well as the energy needed to grow and transport their food, all would reduce the efficiency even further if you were trying to domesticate them. Khalil - This seems like a lot of effort. How does this compare to other renewable forms of energy? David - Commercially available solar panels like you find on many roofs these days are about 15% efficient in converting sunlight into electricity. The newest solar materials coming out of research labs are about double that efficiency. So, for the most part, it would be better off using sunlight to make electricity using solar panels, rather than growing food, to feed to an eel, to make electricity. Khalil - So, in answer to your question, yes, it is possible to harness the electricity of eels, but no, it isn't practical for our everyday electrical needs. There are some situations however, where eel electrocytes might conceivably be a useful power source. For example, to power disposable biodegradable electronics. Scientists like Dr LaVan are also suing what they've learned from electrocytes to inspire research into designing new, artificial power sources. Thanks to David LaVan for that electrifying answer. Next week, we'll be answering this cheesy question from Chris. Chris - Is it true that cheese gives you nightmares? Previous Can cheese give you nightmares? Next What parasites can I catch from my pets?